Please scroll down to see images of The Gidget Floral Bather modeled and in greater detail. Material: Nylon, spandex, and plastic (interior). Colors: Orange, pink, white, green, yellow, and bright lavender. Closure: Each strap has two fabric buttons, in the same pattern, on each strap. Other than these buttons, there are no closures. Label: Perfection Fit by Roxanne and ILGWU. Each strap contains two buttons with corresponding slits to adjust strap length. The straps can be worn criss-crossed or straight across the back. There is a 1.25"w plastic piece that holds the bosom together. It can barely be seen when worn. Minor pilling, mostly near the cups. Plastic strap holding bust tighter together. Instructions tag, located inside the suit by the right side ribs. Tag, located inside the suit by the left side ribs. 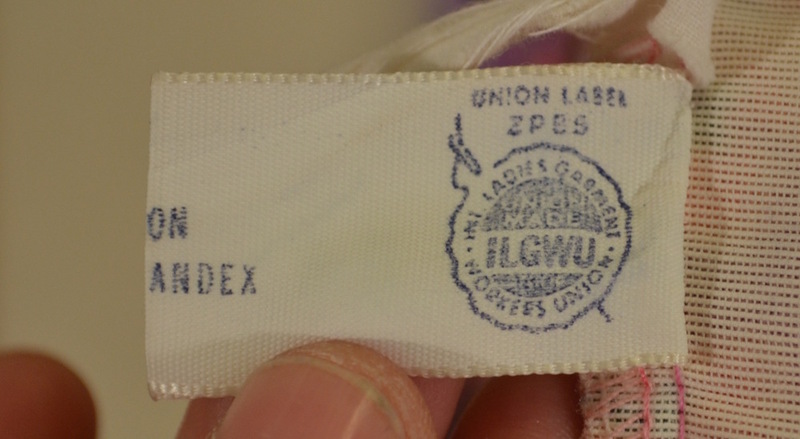 Backside of tag, showing ILGWU label.